Moerlein | Beer Apprentice - Craft Beer News, Reviews, Interviews and Info. Today, I thought I would review another beer from the Christian Moerlein Brewing Company located in Cincinnati, Ohio. The brew is called the Moerlein Barbarossa Double Dark Lager. I am able to find Moerleins quite regularly, since the brewery is located so close to me, however this will be only the second Moerlein I have reviewed on this blog. The website, christianmoerlein.com, has an interesting description of this product. You’ve made a discovery – a Double Dark Lager honoring Frederick I, Emperor of Germany, known as Barbarossa. Folklore says he never died…. instead he sits enchanted in a cavern until the ravens cease to fly, signaling for his triumphant return. 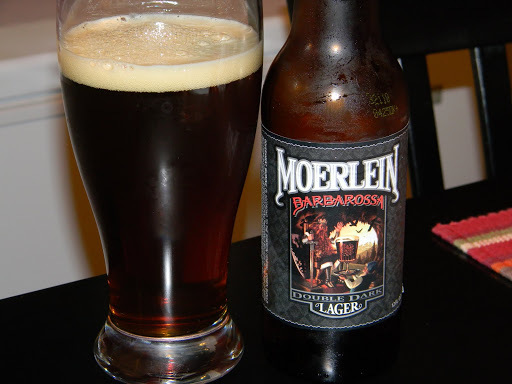 Moerlein Barbarossa is slow aged with a deep reddish-brown color and a malt aroma derived from Munich dark malt. The balanced finish invites a toast to the return of a legend. This beer is categorized as a Munich Dunkel Lager, so let’s see how it tastes. The Barbarossa has an ABV of 5.0% and comes in a 12 oz. bottle. The appearance was a clear, maroon/dark brown color with some burnt orange highlights around the bottom of the glass. A slight, off white head was formed that was somewhat small and had little retention and lacing. It did leave a bit of a silky film on top after it settled however. With the aroma, I picked up a creamy, buttery, dark, earthy malt. Some burnt or toasted grain along with what I found to be a smidgen of sourness. It smelled a whole lot like soured milk. I didn’t find that to be too pleasing really. Way in the back, I discovered hints of bittersweet chocolate and caramel (I wish they would have been more robust). The taste was rather rich and slightly sweet, although dark, roasted malts seemed to be the forerunner. More of the burnt grains along with a breadiness and hints of, what I thought to be, “smoke.” Once more, very faint touches of bittersweet chocolate and caramel and maybe even the smallest bit of a “grassy” hop savor. I wanted to like this taste, but I just couldn’t get into it. It could have been the combinations of flavors that were throwing me off. I may have just not been in the mood for this beer or something. Who knows? The mouthfeel was medium/thin and actually seemed to be somewhat watery. It was smooth, but not as creamy as I thought it would be. It only did an “ok” job of covering the palate with flavor. To me, this beer was just mediocre. I’m sure some may find it to be very enjoyable, but I didn’t enjoy it all that much. I could probably drink it if it was offered, although I don’t think that I would drink more than one or two at a time. I doubt I would go out of my way to find it either. I have a feeling the style was just not to my liking rather than this being a poorly made beer. I did appreciate the nice color though. I really liked that burgundy/brown tint that it entailed. Well, pick it up if you see it and let me know what you think. I would love to get a second opinion. I may try it again sometime in the future and see if my interpretation changes. Anyone who knows me understands that I am a HUGE Cincinnati Reds fan. I, with my family, try to make the long haul to the great Southern Ohio city several times a year and take in a ballgame. The city is beautiful, but still maintains that working class feel and, to tell you the truth, I like that. With baseball season in full swing, I thought I would support the Queen City and review one of their hometown brews. 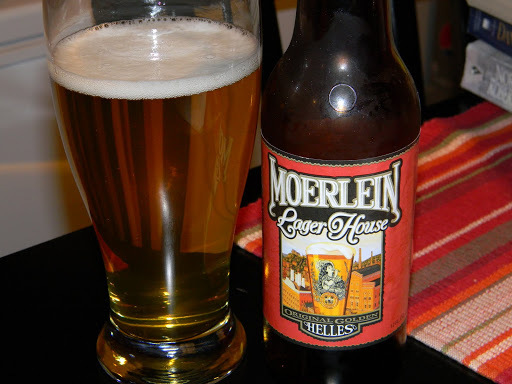 With this post, I’m going to review the Moerlein Lager House Original Golden Helles brewed by the Christian Moerlein Brewing Company. On the website, christianmoerlein.com, I found a nice little description. A Superior Golden Helles Lager. You’ve made a discovery – Golden Helles selected from the original Lager House. Over 150 years ago, Christian Moerlein built his Lager House in Cincinnati’s Brewery District. Today, Moerlein Lager House is brewed to the same standards that declared Moerlein the 1st American Brew to certifiably pass the Reinheitsgebot Purity Law. This Munchner-styled Helles is a remarkably balanced lager featuring a lightly roasted, yet defined malt character, and a touch of hops for a clean finish. The Moerlein has an ABV of 5.2% and comes in a 12 oz. bottle. The beer poured a very clear golden/straw color with a super white head that was small and struggles to maintain its size. It was gone pretty quick and very little lacing was left behind for me to enjoy. A few bubbles were streaming to the top, but even they started to settle down after a few moments. As I brought the glass to my nose to take a whiff, I found a prevalent grain aroma followed by some corn adjuncts and wheat notes. It seemed to have a tiny amount of a toasted, malt essence, but that fragrance was really faint and not forthcoming. To tell the truth, not a whole lot is going on with the smell really. I will say that it does smell pretty clean and fresh though. With the taste, I picked up on the grain”y” flavors first, but I also found a decent butter tinge. Some sweetness and a crisp cracker sampling came through along with a supportive bitterness that did add a slight bit of complexity. However, after a few swigs I began to find more and more of the dreaded corn adjuncts. Well, what can you do? I found the flavor profile to be clean throughout, which mirrored the aroma in that regard. The mouthfeel was medium to light, refreshing, crisp, mostly dry and easy going. A thirst quencher that finishes smooth with a few kisses of flavor left behind. Well, I didn’t find that I had quite the same fondness for this beer as I have for the Reds. To me, this brew is only about a step above a “macro.” It has a few of the same characteristics, with the appearance and noticeable adjunct qualities, but it also had a personality of its own. The flavor was decent, the mouthfeel was ok and the drinkability was rather good. It would make a nice little Summer beer in my opinion. One that could be enjoyed, with ease, at Great American Ballpark. At home however, I would probably look to try something different after a couple of bottles. I have only tried a few of Christian Moerlein’s brews, so I’ll be sure to sample a few more and find one that I like. What Major League Baseball city brews the best beers in your opinion?